As reported in the 20 May forecast the primary infection period for mummy berry disease is now over in Kings County and lasted from April 23rd to May 21st. The list below details the high risk infection periods during this time and overall it has been a pretty good season with only six infection periods documented by the weather station at Tim Strong’s orchard on Brooklyn Street in Kings County; however, growers should expect blight symptoms in the coming days if they have a history of the disease and did not protect at appropriate times. Note that for the first infection period on April 23rd/24th, there was very little inoculum present at that time and only a low percentage of buds of the earliest varieties were susceptible. As such, if orchards were not protected for this infection period they should still expect to see very little damage. There is a second cluster of three infection periods from May 2 to May 6 that is more problematic as they were in the heart of the season and if orchards were not protected significant losses would be highly likely, particularly if they have a history of the disease. The good news is that these three high risk infection periods are close together and could have all been protected against with a single spray. The last two infection periods on May 14 and May 19/20 are also close enough that they could have been protected against by a single spray so in fact two well timed sprays would have been sufficient to protect blueberry orchards from primary mummy berry blight infection in 2016, not too bad at all! How may sprays did you make and were they appropriately timed for the infection periods noted below? How do you know if you have been successful in protecting your plants from infection? If primary infection does occur in your blueberries, blight symptoms will develop 10-20 days from the time of infection. This could be any time now so monitor your orchard regularly over the next week or so for symptoms. These symptoms appear as water soaked or dark brown areas along the midrib and veins of leaves which will soon wilt (Fig.1). 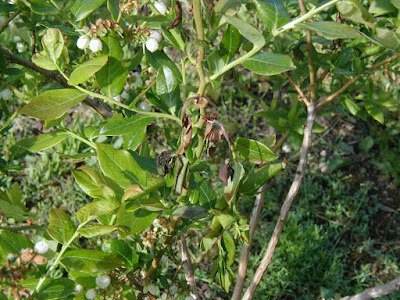 Infected blossom clusters become dark purple-brown in color, and shrivel. A characteristic whitish-grey growth of spores (conidia) is produced on the midrib of infected leaves and is very diagnostic for the initiation of the secondary phase of the disease which ultimately results in the actual mummy berries and yield loss.